Sanchi has played an important role as the intermediary for the spread of culture throughout the Maurya Empire as well as other Indian dynasties such as Sunga, Kushan, Shatavahana and Gupta Dynasties. The first monument to be erected at Sanchi was the Asoka’s column that projected a capital of lions as inspired by Achaemenid art. Sanchi is the oldest extant Buddhist Sanctuary despite that Buddha had never visited the site in any of his former lives during his earthly existence. One of the things that make Sanchi so important is the fact that it is home to the remains of Shariputra, a disciple of Shakyamuni. He died 6 months before his master and is venerated for being an occupant of the Hinayana (small vehicle). Sanchi remained the center of medieval Buddhism even after the spread of Hinduism. It is therefore an important reference point for history between the 3rd Century BC and 1st Century AD. Sanchi was discovered in 1818 by a British Army officer – General Taylor – at the place where it had lain abandoned for more than 600 years. It is located about 45 kilometers from Bhopal and when it was found, it had been overrun by vegetation. The excavation of the site was done in a haphazard manner until the Archaeological Survey of India took control after which 50 monuments were discovered. Stupa 1 was a monument that was enlarged under the Sunga and Andhra dynasties of the 2nd and 1st centuries BC. It features lush carvings, prodigious creations, bas reliefs, and other iconographic treasure trove. 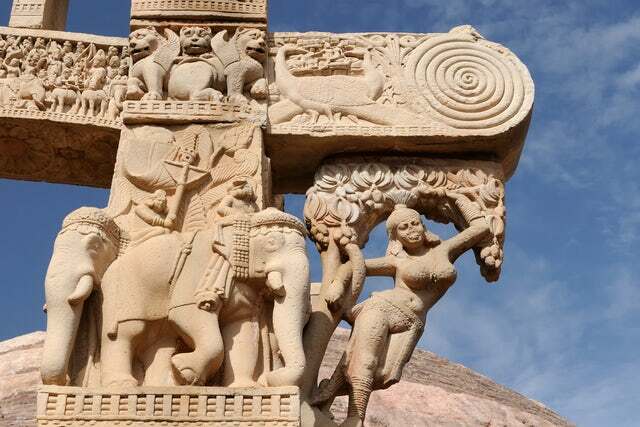 However, the gigantic sandstone mound that features stone railings and a spherical dome measuring 36.6 meters in diameter and 16.46 meters high is the main attraction in Sanchi. Stupa II – This was discovered in 2nd century BC and is said to have been constructed during the reign of the Sunga dynasty. The torana of Stupa 3- This is said to have been constructed in the 1st century and is home to an array of exceptional work. Of course many other structures were found that dated from the 11th -12th centuries. You will find monolithic pillars, temples, monasteries, and palaces. The temple numbered 17 and the monastery numbered 45 are the best preserved monasteries. The site is home to an additional 51 spectacular structures. If you did not know why you should visit Sanchi, now you do. Make a visit to this important extant Buddhist site. It will certainly leave you thoroughly impressed without burning a hole in your pockets.